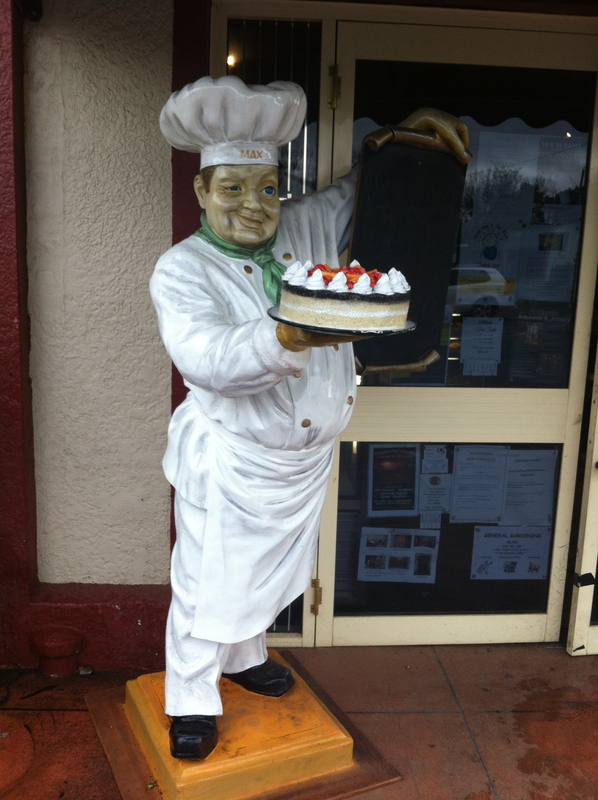 I spent most of it in Tasmania which means I started my week eating more food that other people had made. My lovely nanna, who isn’t very well but who is still cooking a bit, had made me vege savouries (which is basically a very flat, open grill that she pre-makes, freezes and then heats in the oven for snacks) and a peppermint slice. I can’t remember having ever eaten the slice before, but she assured me that the recipe is in the book she wrote for me. It was delicious and definitely something I’ll be investigating in the future. 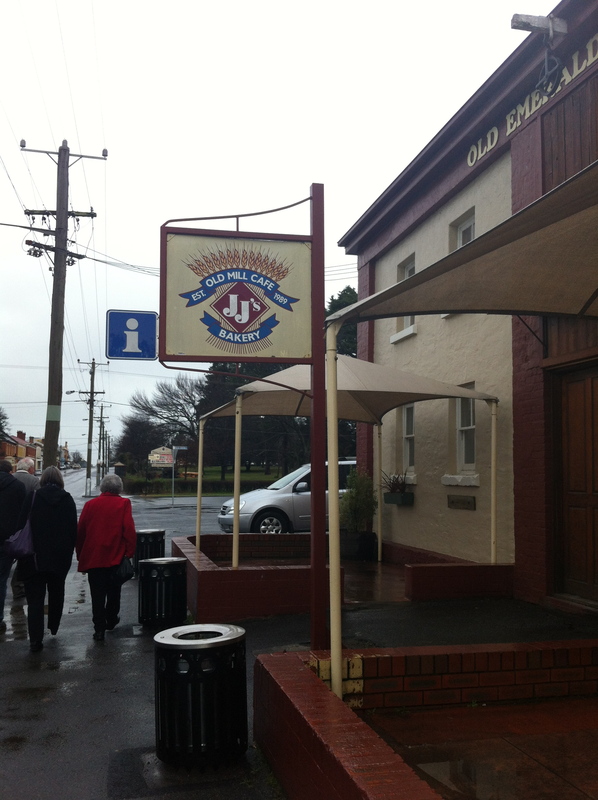 We had a really nice family lunch out at JJ’s Bakery Café in Longford, a small town that’s not far from where I grew up. The bakery is in the old flour mill and is a gorgeous old building. It was a cold, wet, miserable winter day but inside, we sat near the pizza oven and were toasty and warm. 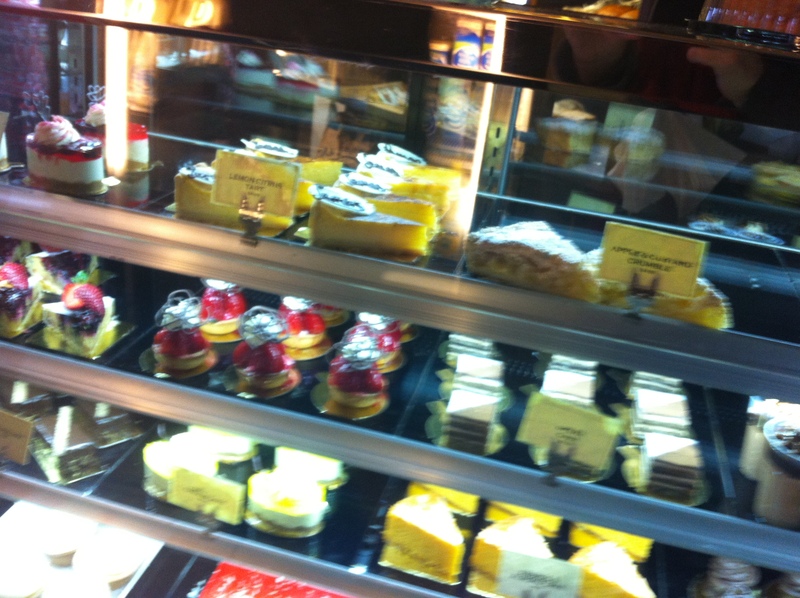 I had a delicious curried scallop pie with salad for lunch, and when we left and I got a look at the cabinet full of cakes, I wished I’d saved room for sweets. I spent the weekend in Hobart with my macaron-maker extraordinaire cousin. She had a little sample box of macs for me to try (gobbled in like, 10 minutes) and then on Saturday night we stayed up late making about a million macarons for me to take home with me. There were so many, we had to freeze them when I got back to Brisbane. 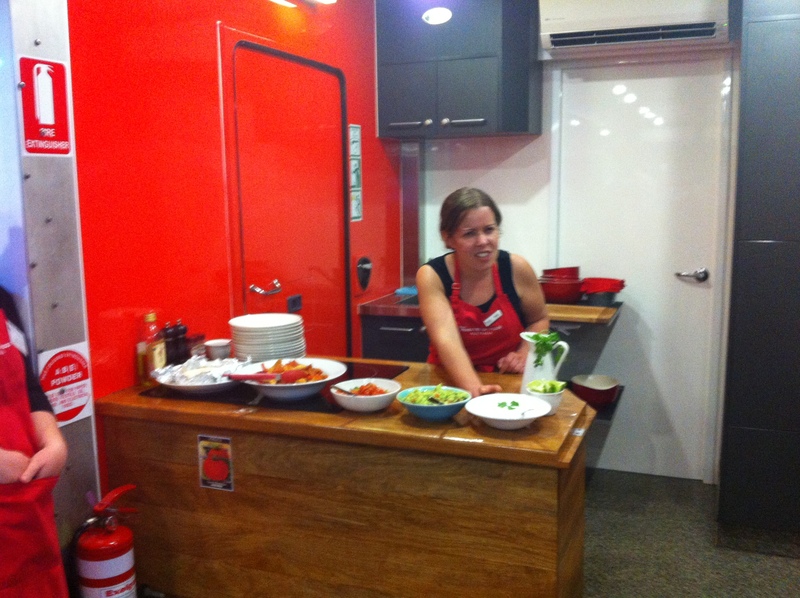 We spent Saturday afternoon eating our way through Salamanca Markets (samples! vegetarian kebabs! homemade jam! ), so between that, the macarons and Nan’s cooking, it’s little wonder the scales weren’t happy with me when I got home. At Jamie’s Ministry of Food, for week two, we cooked the easiest and yummiest chicken fajitas (including a rustic guacamole and a fresh salsa) I have ever eaten. It’s only been two weeks, but I’m definitely finding a bit of my passion for cooking — and that’s cooking meals rather than baking — is sparking up again. I’d fallen into a bit of a bland food abyss lately, which means that I’ve been reaching for sweets to add some flavour into my diet. But I’m learning a lot about spice blends, temperature control, marinating time and other things that are easily done and add bags of flavour to simple dishes. I’m also loving the quick tips about getting an onion peeled and caramelised easily, the way to position foods on your cutting board for ease, speed and safety. Some of the smallest hints have made me think about cooking a meal after work (as little as I have to do it during the week and all) as less of a chore and more of a pleasure. 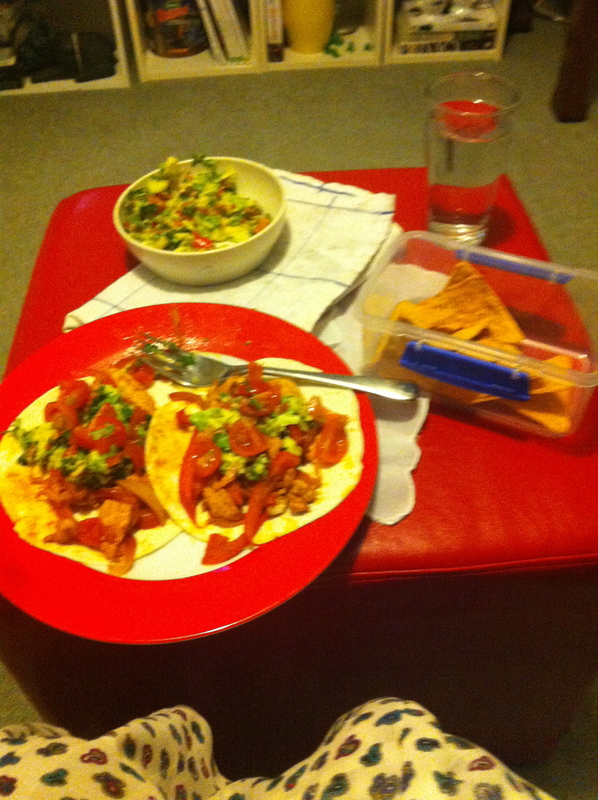 The fajitas, salsa and guacamole are 100% definitely going to become an easy week night meal for me. And again, I can’t wait for the next class! Meanwhile, at home, I prepped the toppers for Mitchell’s sixth birthday biscuits. 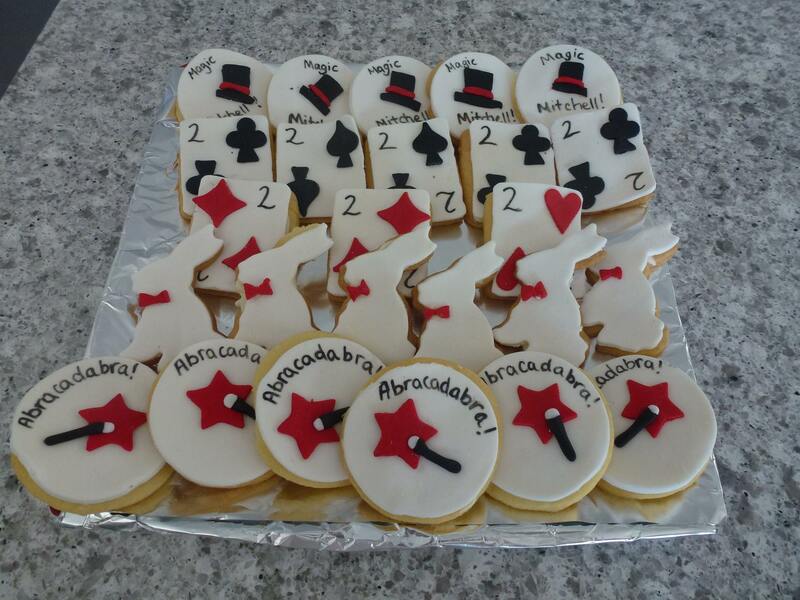 With a magic-themed party, I went with playing cards, magic wands with stars and top hats. I searched high and low for a top hat cookie cutter, and with the search coming up short, I hand cut the hats. I left the toppers to firm up during the week, made the biscuits on Friday night and put them all together on Saturday in time for the party on Sunday. There’s lots more to come next week, and I know I keep hinting at it, but I hope that very soon I can let you in on some secret, Choc Mint Cupcake business that I’ve had brewing for a while! Fingers crossed.